" ... This is the man who deserves the Medal of Freedom? It makes a mockery of human rights and the meaning of the award being given. ... "
Before leaving office, George W. Bush plans to award Colombian president Alvaro Uribe the Medal of Freedom, the highest civilian medal he is able to give to anyone. Bush says Uribe deserves the medal for promoting democracy and human rights. That Bush is making claims about another country's human rights record should raise general skepticism given his own trouble with adhering to US and international laws on torture, the detention of prisoners without due process, and the launch of at least one illegal and unnecessary war. While this little publicized award ceremony for Uribe will likely be surpassed by more pressing news stories, such as what kind of dog the Obama's are planning to get, readers may recall the sharp turn taken in one of the presidential debates last fall when the subject of Colombia and its human rights record arose. In defending his support for a NAFTA-like free trade agreement with Colombia, John McCain described Colombia as an ally and challenged Barack Obama's knowledge of the situation in Colombia, saying, "maybe you ought to travel down there and visit them and maybe you could understand it a lot better." For his part, Obama argued that US needed to adopt a different position with regard to the Colombian government under Alvaro Uribe because of a troubling human rights record that includes the Uribe administration's refusal to address the killings of hundreds of labor union members by government security forces and paramilitary groups aligned with the government. 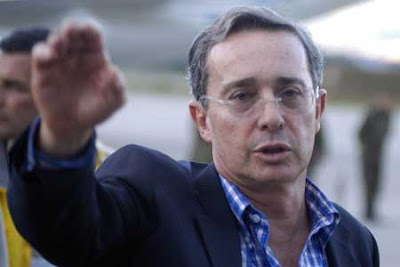 Labor and human rights activists believe that Uribe has personally endorsed the violence committed by Colombia government security forces and friendly paramilitaries against labor and democratic movement leaders and activists, as well as other non-combatants. When some US labor movement leaders traveled to Colombia and met with Uribe in early 2008 to lobby on behalf of human and labor rights, Uribe justified the extra-judicial actions of his government's security forces by accusing labor activists of being aligned with drug dealers and terrorists. Uribe's relationship with ultra-right paramilitary groups goes back to the 1990s when, human rights activists say, he aligned himself with them as the governor of Antioquia whose capital is Medellín. Uribe comes from Colombia's landowning families which has long relied on domestic military power to maintain its rule. In addition, after an education in elite US universities, Uribe served as a CIA asset during the 1980s. After Uribe's rise to political prominence in the 1990s, his paramilitary allies acted with impunity and raised funds for their activities by participating widely in the country's infamous drug trade. In 2002, Uribe successfully ran for his first term as Colombia's president. During that campaign, his paramilitary allies worked to suppress political opposition, including those in the country's media and its labor union leaders who demanded answers about his ties to illegal groups like the paramilitaries and drug traffickers. In at least one instance, producers at one media outlet that did try to examine these issues were forced to flee the country after receiving death threats, presumably from paramilitary forces close to Uribe. Recently declassified CIA documents reveal a long history of ties between the Colombian army and the paramilitary groups with whom Uribe fostered a political alliance. According to documents newly obtained and made public this week by the National Security Archive, a research group at George Washington University, CIA officials reported in 1994 that Colombian military leaders had "adopted a body count mentality" in their war against insurgents. Further, they stated, Colombian military leaders seeking promotions and advancement had "a history of assassinating left-wing civilians in guerrilla areas, cooperating with narcotics-related paramilitary groups in attacks against suspected guerrilla sympathizers, and killing captured combatants." Additionally, the new documents revealed that in 2000, both paramilitary leaders and Colombian army officials claimed responsibility simultaneously for the extra-judicial assassinations of two guerilla leaders who had for years given up their own activities. The claims prompted US Ambassador Curtis Kamman to describe it as "a clear case of Army-paramilitary complicity," adding that it was "difficult to conclude anything other than that the paramilitary and Army members simply failed to get their stories straight in advance." These activities prompted the US State Department to label as terrorists the paramilitary groups involved, who by this time were political allies of Alvaro Uribe. In 2007, leaked CIA documents revealed that joint Colombian army and paramilitary operations continued. According to official sources, dozens of people were killed in those operations and political offices were filled by known leaders of the paramilitaries who also had ties to the drug trade. As president, Uribe provided the leaders and rank-and-file members of the terrorist paramilitary organizations with amnesty and protection from international prosecution as part of a process of "demobilization" of the paramilitary groups. In fact, according to the Council on Hemispheric Affairs, many militia leaders have found new business opportunities with and political power and protection in the Uribe administration. This is the man who deserves the Medal of Freedom? It makes a mockery of human rights and the meaning of the award being given.